Can You Wear an Embroidered Top And Not Go Boho? If you’re like me, bohemian is not how you would describe your style. All the same, a girl sometimes likes to wear flowers on her sleeves. 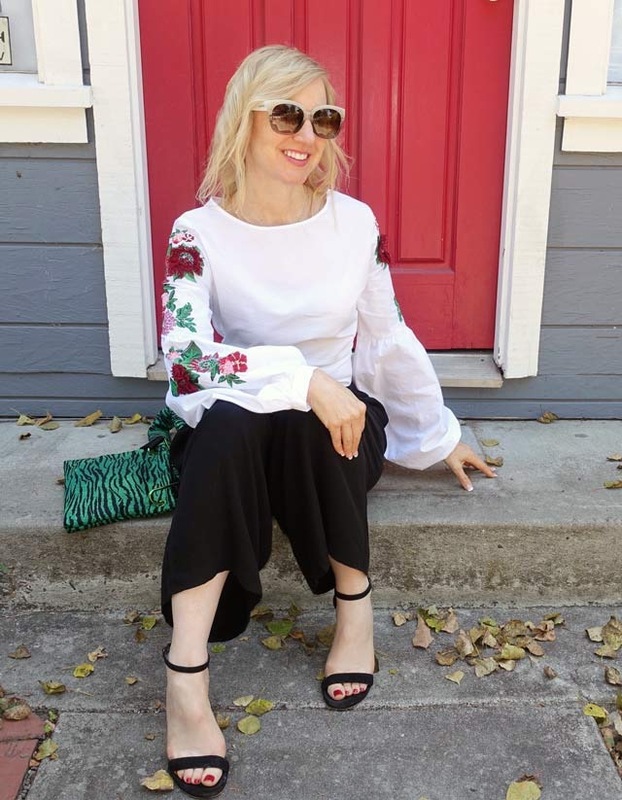 This is how I style an embroidered top without going full-on boho – and here are a few additional tips. 1) Let your embroidery serve as an accent along with more classic/sophisticated/polished pieces. Notice how my black pants and sandals take a backseat to these eye-catching sleeves? And at the same time, they set the tone for more formal viewing. 2) Consider embroidery like any another print for playing Print-on-Print (one of my favorite styling games). I love mixing prints. 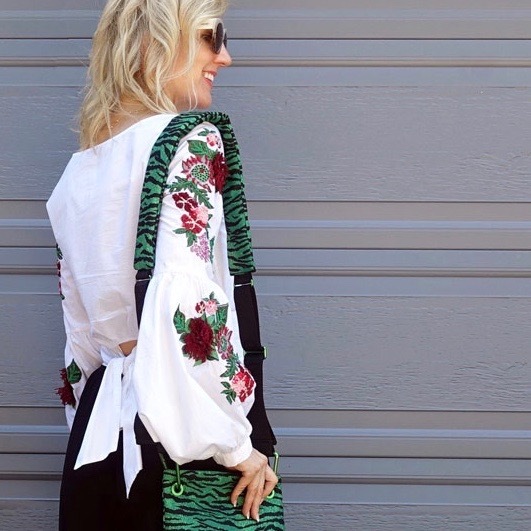 And a favorite way to do so is by wearing a piece that is predominantly one color (like green in this zebra-striped bag) with a piece that uses that color as a secondary hue (the greenery in the embroidered floral motif). 3) Since much of bohemian-styled clothing is loose and billowy, contrast it with fitted pieces. Or as in this case, choose your pieces to create an hourglass-ish silhouette. The band (which ties in the back) and high waistline of this blouse allow me an opportunity to create a classic silhouette. I only have to pair it with a high-waisted garment that flares on the bottom. One piece which achieves this is my black A-line silk midi skirt from THIS POST. I wore it here with wide-legged cropped pants. The cut verges on looking bohemian (harem-like). But a pair of high-heeled sandals instantly cancels out that association. Another boho-light way of styling the top for this fall is with dark-wash skinny jeans and mid- to high-heeled booties. 4) Style your embroidered piece with smoother, more polished textures. Notice how this bag has a very sheeny, sort of techno finish? Not so bohemian really! The same goes for the luxurious black fabric of my pants. 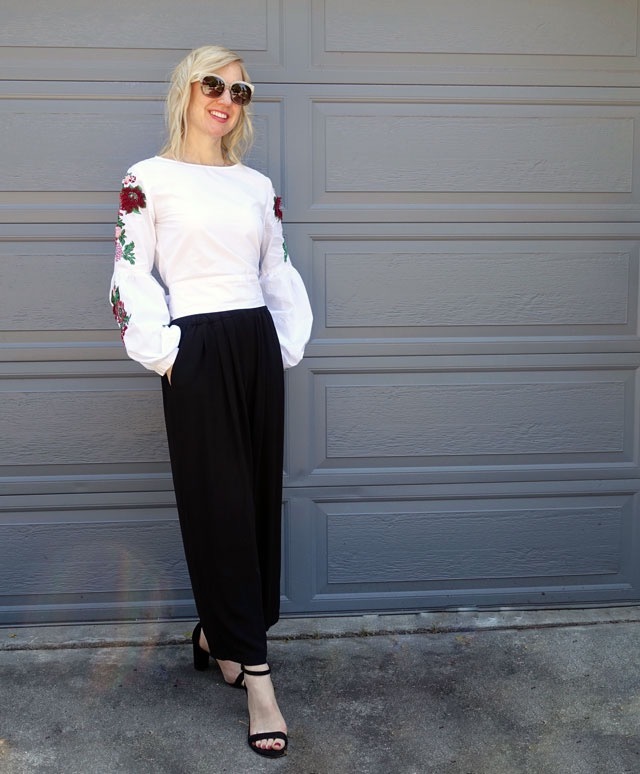 I hope you enjoyed this boho-light version of styling an embroidered top. I used to dress full-on boho most of the time (soon after moving to hippy-friendly Santa Cruz, California). It was super fun at the time. But I now feel that my personal style just doesn’t go there anymore. Do you like to dress boho? Beautiful blouse! Really nice outfit! Nice tips, I love embroidered pieces as well, especially on skirts. Yours look so fab though! I love this pairing- classics with boho definitely gives a more polished vibe! They are fun. Glad you like them, Angelie!